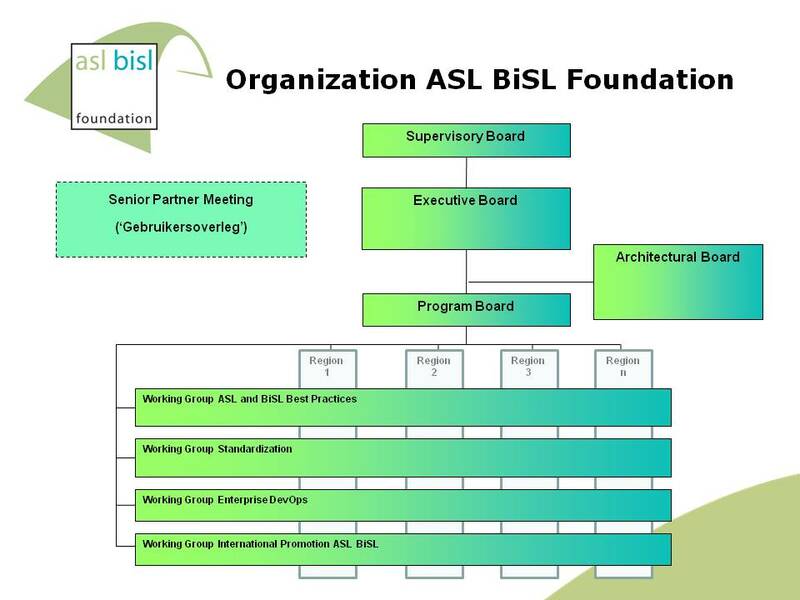 ASL BiSL Foundation (formerly ASL Foundation) has managed ASL® and BiSL®’s key ideas for several years, and is now developing them further. In doing so, it is seeking to bring business and IT closer together. The supply of information – perhaps by its very nature – needs to take place via an integrated chain. Information systems and related applications have a long shelf life. Constant modifications are making these systems increasingly complicated and expensive to manage and renew. The control of IT processes is crucial here. ASL BiSL Foundation is a meeting place for professionals with a common interest. The Foundation encourages the improvement of working methods and the exchange of best practices. Co-operation offers great advantages. The experience of others helps to improve management processes within each organisation. And each organisation’s own experience helps other companies. The result should be an improvement in the quality of the overall service provided industry-wide. To achieve its aims, the Foundation holds conferences and special-subject evenings. It makes high-quality best practices available, publishes articles and white papers, tries out syllabuses for ASL and BiSL examinations, and sets requirements for certification of application management organisations. The working groups described below are responsible for these activities. ASL and BiSL Best Practices: gathers, selects, edits and publishes ASL and BiSL practices and monitors their use. Standardization: contributes to international standards for application management organizations and information management organizations, in collaboration with ISO/IEC and the Dutch Standardization Institute NEN. Enterprise DevOps: shares knowledge and experience about application of DevOps to business operations and to the field of IT and information provising , in cooperation with Agile Consortium. Thematic groups: are organizing theme sessions and publish white papers on topical themes in the field of information services, such as ‘Innovation of Information Management and Business’, ‘Agile and ASL & BiSL’, ‘Data & Security’ and other topics related to ASL and BiSL. Annual Conference Program Committee: organizes the annual conference.